This Saturday night, at the St. Joseph Civic Arena, the Blacksnake Rollergirls will hold their last bout… ever. Once the championship trophy is awarded, the curtain will fall on one of the most beloved leagues the Kansas City area has known. But believe it or not, roller derby will live on in St. Joseph. More on that in a minute. As obsessive roller derby fans, we are saddened to hear that this amazing chapter in Kansas City roller derby history is coming to a close. We’ve had leagues in this town hang it up before. The Cowtown Butchers quietly dissolved mid-season a couple of years ago, and the Kansas City Banked Beauties‘ debut season was also their swan song. To be fair, those were a bit different: banked track leagues often face crippling expenses just to maintain the track, making them nearly impossible to sustain without the one thing newborn leagues tend to lack — significant capital. And unfortunately, men’s roller derby leagues are a little like women’s basketball in that they often don’t have the same sizable fan base that their counterparts enjoy. We had the opportunity to sit down with Notorious L.I.Z., founder of the Blacksnake Rollergirls, to get the scoop on why this had to happen… and what the future of roller derby might be in St. Joseph. It turns out that flat track leagues need a pretty sizable income to keep the wheels turning too. That’s not news to us, but the public often doesn’t realize just how expensive this whole endeavor can be. But roller derby fans have reason to rejoice, because although the Blacksnake Rollergirls are dissolving after this season, a new non-profit league will take its place in 2017 without interruption. L.I.Z. was understandably brief with her comments, but gave us all we needed to know. Not much is yet known about the new league that will take BRG’s place in 2017. The non-profit organization itself is in place, but neither the league name nor the team names have been voted on yet. Complicated business regulations we clearly don’t understand prohibit the direct transfer of properties and assets to the new league. By law, a for-profit business isn’t allowed to simply become a non-profit just like that. Come next season, then, all the teams will have fresh names and logos, but the faces behind them will largely remain the same. Right now, it’s still very early. Needless to say, we will keep you informed as all the new information becomes available, and KC Derby Digest will happily cover this new league in future seasons, same as we did BRG, if they’ll have us. But in the meantime, we have a championship to skate for. The 2016 Blacksnake Rollergirls championships — their final bout ever — will be held this Saturday night, August 13, at the St. Joseph Civic Arena. 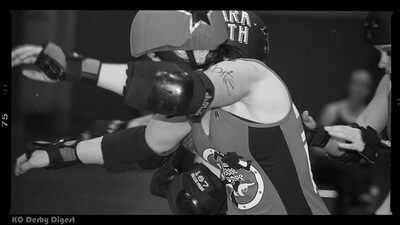 The Venomous Vixens will face off against the Danger Dolls for all the marbles starting at 6 p.m. Immediately following, the Rushin’ Rollettes and Jesse Janes take the track for the annual grudge match. You can click here for all the details on the Facebook event page. Join us in St. Joseph this Saturday night to give these Blacksnake Rollergirls the send-off they deserve! Thank you to each and every member of the Blacksnake Rollergirls organization who helped make these past five seasons possible. Covering derby in St. Joseph isn’t like going on the road, but we don’t have much of a travel budget, so it’s about as close as we get. During these last five years — our first five years — the Blacksnake organization has welcomed KC Derby Digest with open arms. 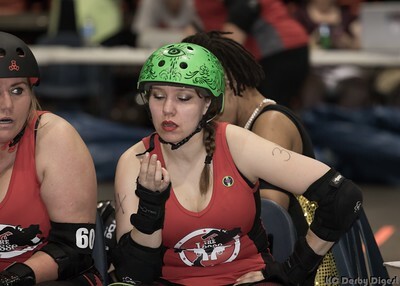 Even during those seasons in the past when it seemed like some leagues could take us or leave us, the BRGs’ reciprocal support for KC Derby Digest never wavered, and we hope to forge an equally beneficial relationship next season with the new league. As a derby blogger and faux-photojournalist, I never needed to let anyone know I was coming to St. Joe, I just showed up on bout day. And when I got there, I walked in the door with no problem, accessed the arena with no problem, and had everything I needed to do my job — no problem, no questions asked. They welcomed our coverage and supported our endeavors, same as we have theirs, and made us a part of their derby family. We couldn’t be more grateful for the Blacksnake Rollergirls. To every Blacksnake skater, male and female, who put their all into their derby endeavors and inspired generations of fans and potential players, thank you. To every volunteer, announcer, NSO, referee, and photographer who helped bout day in St. Joe go a little more smoothly, thank you. To every league member who ever served on a committee, the Board of Directors, or worked behind the scenes to make these events come off without a hitch, thank you. And perhaps most of all, to Notorious L.I.Z., founder of this incredible league… how could any of us repay you for the opportunities you’ve given so many? Roller derby simply wouldn’t exist in St. Joseph without your initiative, your passion, your sacrifice, your dedication, and the thousands of hours you’ve poured into this unbelievable labor of love. Every player who ever set wheels on the track at the Civic Arena owes you a debt of gratitude, and we look forward to seeing you back in action next season as the new league takes its place in Kansas City roller derby history. For all the trials you’ve faced these five years, you certainly made it look easy. 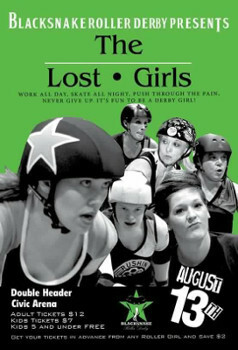 Thank you KC Derby Digest for your support and dedication to the sport of roller derby! Your presence trackside completed our roller derby experience. Although BRG is coming to an end, we can relive our last 5 years through your pictures. Thank you. That Notorious L.I.Z. is an amazing lady. What she managed to create and foster in St. Joseph is nothing short of miraculous. Sad to see BRG close its doors. It was nice to have a family-friendly sport in town that empowered women the way only roller derby can. Glad that it’s not gone forever, we will look forward to what happens next. AS the first announcer for Blacksnake, this makes me very sad. I hope the non profit rocks. I miss you gals and this league will hold a special place in my heart.